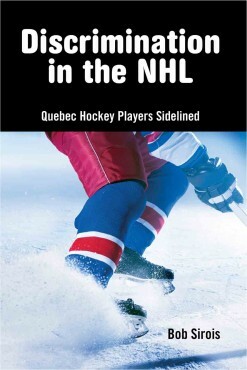 In Books Tagged In Bob Sirois, Books on Quebec, Discrimination, Hockey, NHL, Quebec, and Racism. “I agree 100% with him (Bob Sirois),” said two-time Stanley Cup winner Bobby Holik on TSN, November 2, 2010. Ever since Maurice Richard dazzled hockey fans, fighting his way to hockey’s summits, the issue has festered. NHL veteran Bob Sirois demonstrates that unless Quebec hockey players are superstars they are less likely to be drafted than other Canadians, they can expect shorter careers and less pay, and they are totally excluded from some NHL teams. As solutions, Sirois proposes an NHL team for Quebec City and a Junior Team Quebec for international events. Bob Sirois’ search for truth can only enhance the great sport of hockey. Listen to Jeff Blair talk with Bob Sirois about this book. Bob Sirois played for the Philadelphia Flyers and the Washington Capitals, earning 212 points in 286 NHL games. He represented the Washington Capitals in the 1978 All Star Game. Forced to retire early by a severe back injury, he has remained active in hockey. Bob Sirois lives in Montreal.